When materials break, or fracture, they do so in one of two modes – ductile or brittle. For ductile fracture, picture chewing gum. After the gum has been chewed some, it can be stretched quite a bit before breaking and the cross section gets very thin. For brittle fracture, picture window glass. When it gets stressed, it shatters without stretching at all, and the thickness doesn’t change much either. Most materials exhibit ductile or brittle behavior under different conditions. For instance, consider the chewing gum, but imagine it has been frozen in liquid nitrogen. In that cold state, it shatters just like glass when struck by a hammer. Reconsider the glass, when it is heated by a glassblower, it stretches and gets thinner just like the chewing gum! 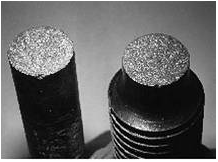 Metals can fail in ductile or brittle fashion. 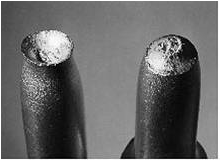 In the image on the left, aluminum has failed in a ductile fashion – the cross section got thinner, or it “necked down.” On the right, mild steel failed in a brittle fashion and there wasn’t much change in the cross sectional area at all. If we had measured the stretching of these two samples, we would have also seen that the aluminum on the left stretched more than the mild steel on the right. Generally speaking, brittle failure is not desirable. Engineers and safety officers would prefer that a component give some warning before it breaks. In ductile fracture, it deforms, elongates and decreases in cross section before fracture. In brittle fracture, little if any warning is given. Consequently, one of the first things a forensic materials scientist looks at when evaluating a fracture is whether it was ductile or brittle. If it’s brittle, he will look for an explanation as to why it was brittle and whether it should have been ductile. In some cases, such as glass window panes, brittle fracture cannot be avoided. But in many cases, brittle fracture should be avoided and, if evidence of brittle fracture is found, it can be an indication of a problem with the material design or manufacture.